The historical Condado Vanderbilt hotel in San Juan was built in 1919 by Frederick William Vanderbilt and reopened recently with 323 rooms and a gourmet restaurant 1919 (named after the year the hotel was built). 1919 showcases the cuisine of Puerto Rico using organic and local ingredients. The kitchen is headed by chef Juan Jose Cuevas, a Puerto Rican and C.I.A. graduate who worked in Spain at El Raco de Can Fabes with chef Santi Santamaria and in New York at Essex House with Didier Elena and Blue Hill at Stone Barns with Dan Barber. 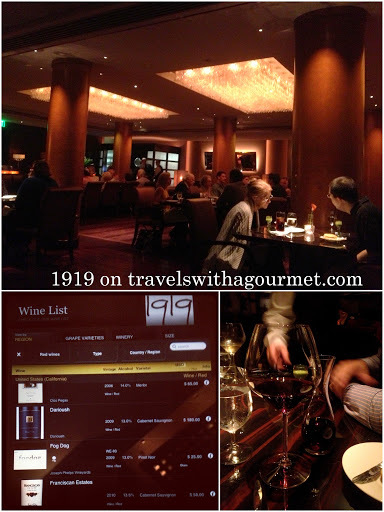 I was looking through Open Table for a new restaurant when I stumbled upon the listing for 1919 which had only been open a few weeks. I immediately booked a table for dinner that Friday. We arrived to a half-full dimly-lit restaurant with modern interiors. We were led to a table near the large picture glass windows which would have had a full view of the sea at lunch, but as it was in the evening we had the indoor garden and a coqui making its’ nightly noises as company instead. Luckily, the restaurant filled up soon after and the coqui got drowned out by the restaurant bustle. Service was impeccable and seamless, the waiters were attentive and knew the menu well and the general manager was present to check that everything was going smoothly. The dinner menu is labeled simply first (salads and starters), second (pasta and risotto), third (fish and meat main courses) and fourth (desserts) with a supplementary cheese course ($12). 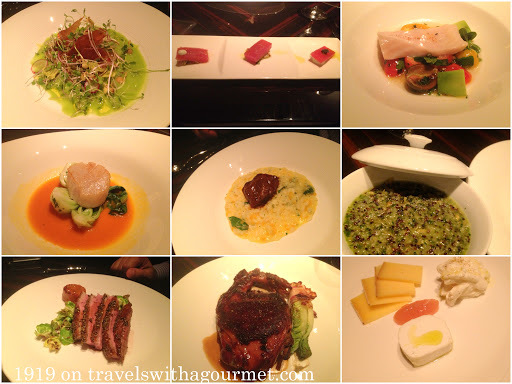 It is recommended to order the prix-fixe four-course menu ($70) but the dishes may also be ordered a la carte. (There is also a three-course prix-fixe menu for lunch.) We opted for the dinner prix-fixe and substituted the dessert course for the cheese course. The wine list is on an iPad and was fun to look at with the numerous bottles and labels listed. We settled for a glass of 2009 Fog Dog Pinot Noir for myself glass of 2009 Chablis from Joseph Drouhin for A. Wines by the glass come served in a small carafe which makes for a generous measure. For our first course, A had the white eggplant confit and I had the taste of tuna. The eggplant confit came in a salad of sprouts and was topped by a crispy slice of jamon Iberico and green gazpacho – a creative dish with fresh flavors. The taste of tuna was a trio of raw tuna prepared three ways – one with mozzarella caviar, another with pine-nuts and capers and the last with octopus and preserved lemons. This starter was less interesting than the eggplant confit as it was the typical raw tuna plate plus it was served so cold that I couldn’t distinguish much of the flavors and all three pretty much tasted like cold raw tuna. Second course was the local calabaza (squash) risotto for A and scallop a la plancha for me. The risotto was sweet from the squash, tangy from the spinach and rich from the braised veal cheeks – a balanced enough dish but heavy as a mid-course. My scallop a la plancha (scallop cooked on a griddle) came on top of local bok choy and an aromatic broth. Although the single scallop was sweet and succulent, it sadly lacked the umami component as it didn’t have the caramelized crust formed by searing in a hot pan. A surprise third course was sent out by the chef which was the best dish that night – wild white salmon placed on top of broccoli, guanciale (unsmoked bacon made from pig cheeks) and green tomato jus. Here the barely-cooked fish was perfect and the jus and vegetables that accompanied it were delicious as well. A dish that was deliciously simple and simply delicious. The main course was served next – terres major wagyu beef (supplement fo $10) for A and the evening’s special, not on the menu, cochinillo for me. The wagyu beef short ribs came with onion cream, stir-fried okra and a side dish or organic grains. The meat was tender and flavorful and the accompanying okra and onion cream complemented the simply grilled meat. The organic grains though, were hard to chew and tasted like uncooked wild rice. The cochinillo was a quarter of a suckling pig with almost black crackling (a bit overcooked for my taste) and was good but not great while the accompanying charred baby lettuce was a nice way to cut the richness of this dish although it could have done without the accompanying bacon wrap as the whole plate was already filled with a large chunk of pork. The cheese course came last – three cheeses: a hard manchego-like cheese, a soft local goat’s cheese and oddly enough – fresh mozzarella (I’ve never seen this served as an after-dinner cheese course). There was also a dollop of sweet guava jam and two types of bread: crusty bread (similar to pain de campagne) and a super sweet nut bread almost like a spiced banana nut bread which did not go with the cheese at all. We ended the meal with espressos – overly roasted and bitter – which we didn’t finish and left sated but unimpressed. Perhaps another visit might prove to be more promising and we do intend to go back once the restaurant has been open for several months to give it another try.